Thursday Doors is a weekly feature allowing door lovers to come together to admire and share their favorite door photos from around the world. Feel free to join in on the fun by creating and sharing your own Thursday Doors post each week between Thursday morning and Saturday noon (North American eastern time) by using the blue link-up button below. I haven’t been able to get out on any new ‘DoorScursions’ lately (thanks Joey!) so I’ve been dipping into my archives the past few weeks. 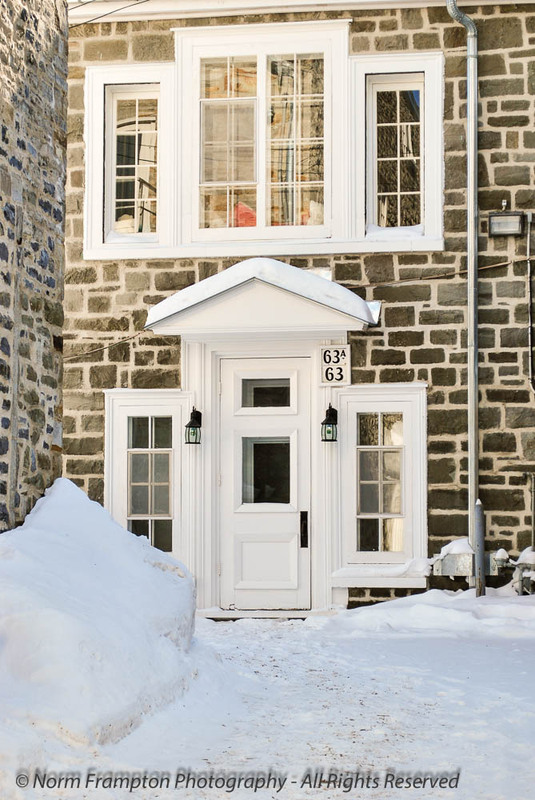 While looking through my unused door pics in preparation for this post I noticed that I still had a fair number of interesting ones from our trip to Québec City last winter. While we were there we spent a night at the Ice Hotel which you can read about here and I got some great shots of the Ice Climbers at Montmorency Falls that you can view here. 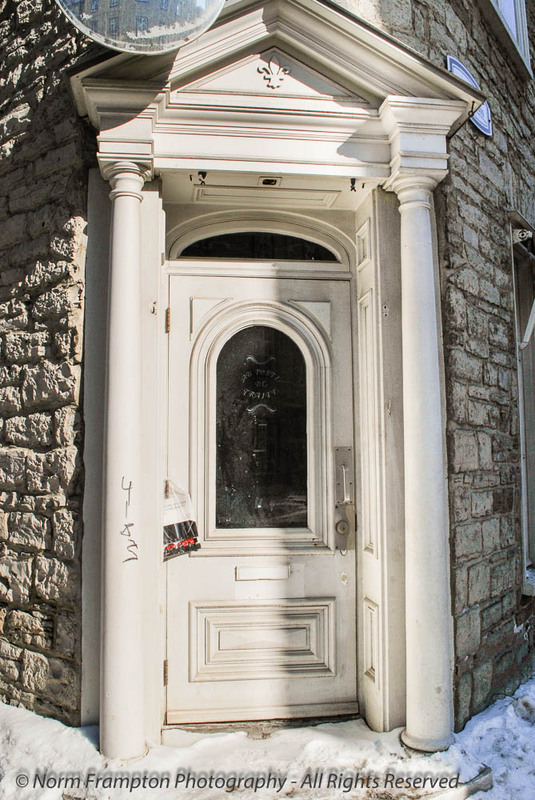 As I scrolled through my unused Old Québec doors I noticed an unusual number of my remaining shots were of beige doors. Hmm, I guess without realizing it I was favoring the brighter more vibrant reds, blues, and greens. 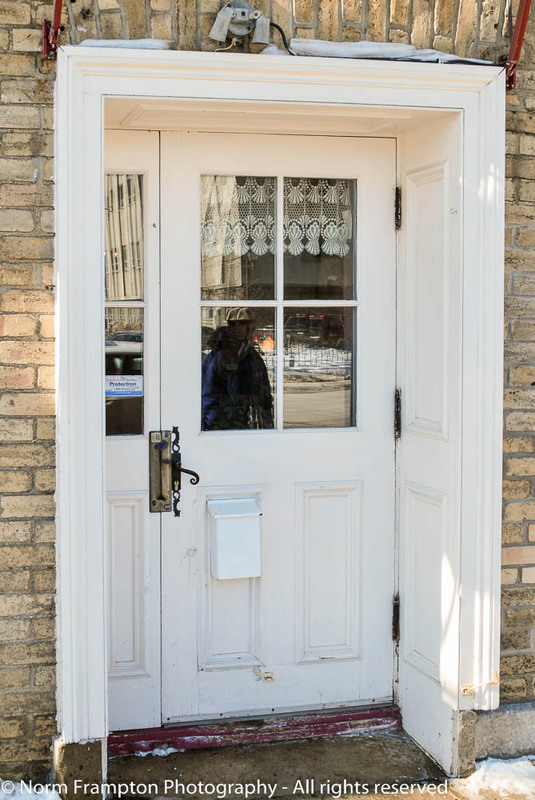 If you share your posts on Twitter and Instagram remember to use the #ThursdayDoors hashtag and please do take a few minutes to visit the Thursday Door posts shared by others. 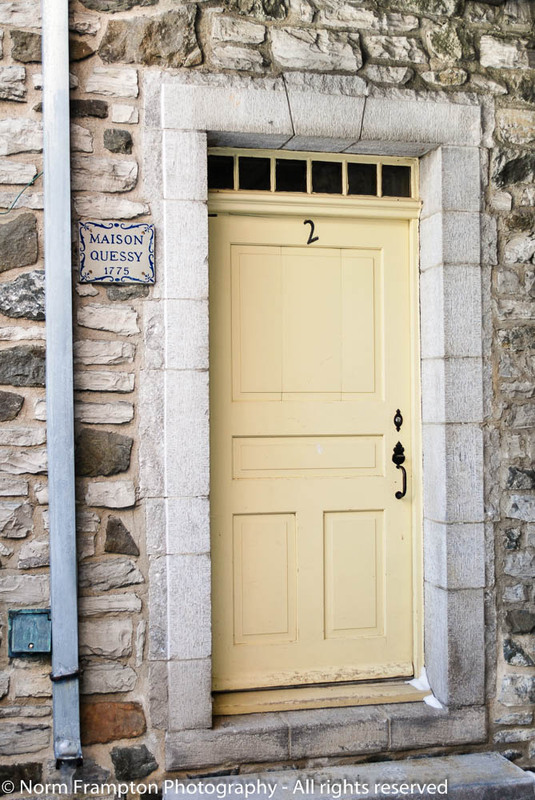 Gallery | This entry was posted in Photography, Thursday Doors and tagged Canada, Doors, Historic Architecture, Old Buildings, Photography, Québec, Quebec City, Street Photography, Thursday Doors, Vieux Quebec, Walking Tours. Bookmark the permalink. 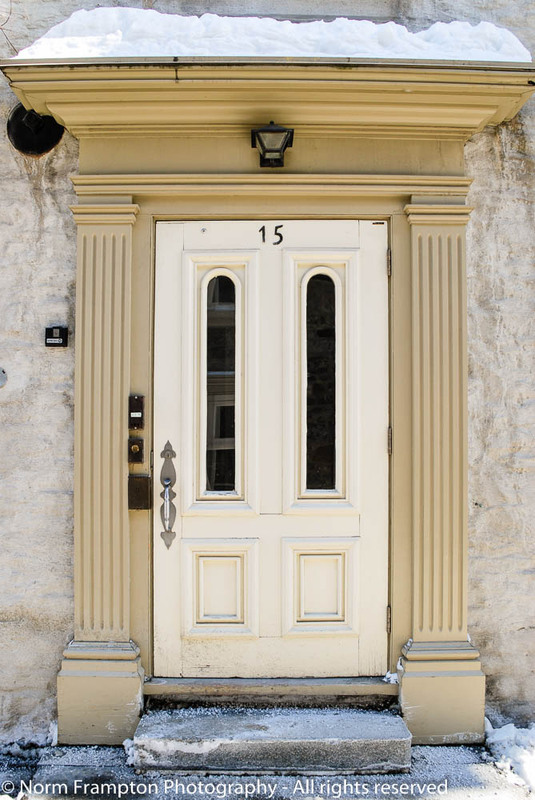 Quebec City has the best doors. I love that last one! Cool selection Norm! Can’t help myself, I just love the black one but also rather like the slightly neglected one at the end with 4183 scribbled on the pillar. Can’t imagine being N°4183, we’re the only house for a kilometre around but thanks to the post office’s new system we now have to put a N°1 on our address, crazy! I get stalled with “there cannot be more than 60 days between opening and closing date. Extend your account.” Then when I go to my account, it seems I have to pay?? Maisson Quessy, 1775. Since wandering around the UK, I’ve become a huge fan of this tradition of posting the year in which a house was built. The number 2 seems just a little off kilter (which I like), and there’s just that tiny bit of snow on the door sill. Was there a recent snowfall? Is it Spring and that is all that remains? Some lovely beige doors Norm but I love No 10 with the circles and unusual fanlight window. Judging by the placement of the doorknob, is this a particularly tall door or was the knob installed for a particularly short person? It jumps out as being out of place. It’s very rare to see a door built into a corner like this. Door number four is sweet with the windows, curtains and little mail box. great collection, my favourite is house number 63, I like the symmetry of the lower and upper part. Thanks Bernice – who knew beige doors would be so popular? I like the brick work of Number 2! I’m sure the beige doors stand out more with the foliage is in bloom! Great doors! A mix of interesting handles, some appearing newer than others; some looking alive and some deserted; reflections…of you? The first is certainly stately, the second one very inviting and I like that little splash of color with the Maison sign. Thanks again for inspiring us and hosting. I, too, need to get out and shoot some new/more doors! Thanks. Yes many of these doors do have a French influence. Great collection! I really like the doorway framing of the first picture. How very grand. The fifth picture (with the #10 on it) is very bold. The door itself certainly makes a statement. This all makes me want to go get a new door at my house. I need more of a grand statement! Great collection in Beige! My favorite is the first door though. I love the arched glass window panels, and the fleur-de-lis in the bottom panels. My vote is definitely for the first door. That door screams uniqueness but in a very classy kind of way. Also, it has fleur-de-lis on the door panels. LOVE the fleur-de-lis. Thanks Joanne – yes that mailbox is unique, I don’t think I’ve seen anything like that before or since. Thanks Joey. I hadn’t thought much about doing a color themed door post before but I think I might try this more often. I like something about all of them, Norm, but I like the stately beauty of the first and the simple beauty (and the surrounding stone) of the second. Thanks Janet. I like them all of course, but it really surprised me when a realized how many beige doors I had. All of the beige doors are beautiful but the black one is my favorite. It is so impressive. 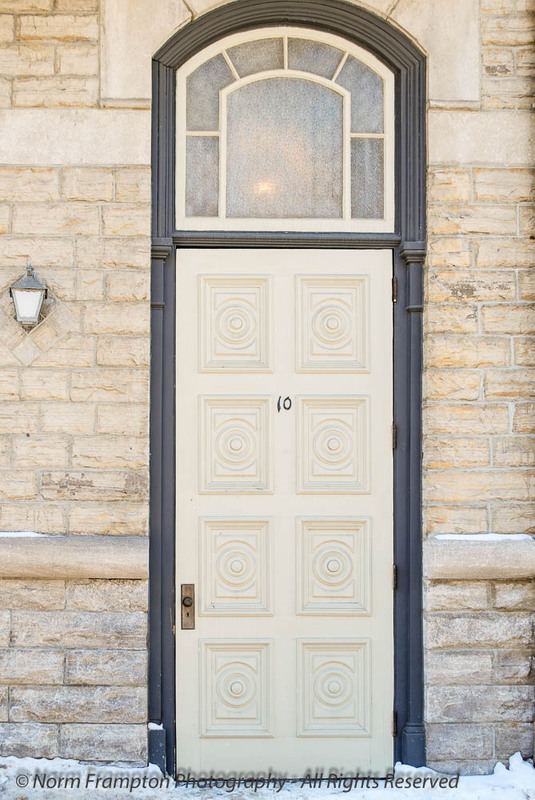 I’m partial to stone and these doors are great with that element. Number 10 – long and tall, waiting to be opened. I like them all but that one is my favourite this week. Love them all, Norm. That last one is my favourite, though, set at such an interesting angle. That’s very true Jean. It’s not often they put a facing out door right on the corner like that. You pulled some lovely doors out of the archives, Norm. I like the wooden door that is set back into a paneled entrance way. That’s a lot of woodwork. I also like the one, near the bottom where the door and the center window is higher than the side lights. 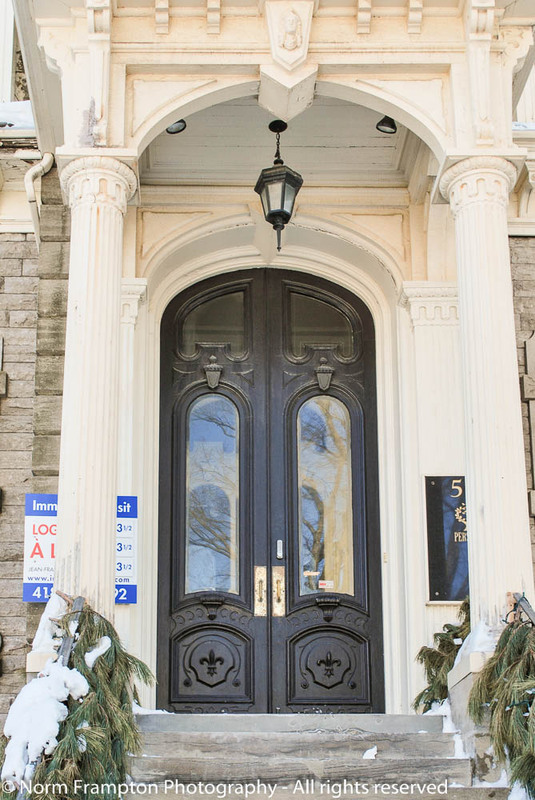 I also like the arched doors, the arched transom light and the arched panels in the doors. I love the door at the bottom that is set into the corner! Did I miss any? Seriously, this is a great collection today. I never realized I had so many interesting beige doors all from the same place. Beautiful beige (bar one!) doors, I do miss solid, meaningful doors in this neck of the world!